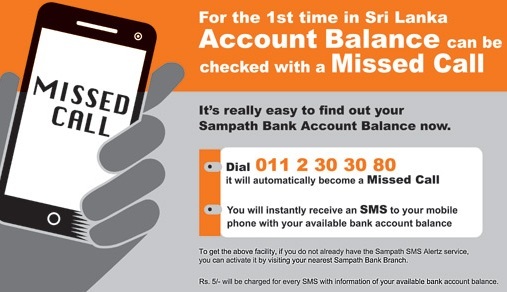 Sampath bank introducing new facility for their members the named Sampath Missed Call Banking, now you can check Sampath Bank Account Balance simply via SMS. 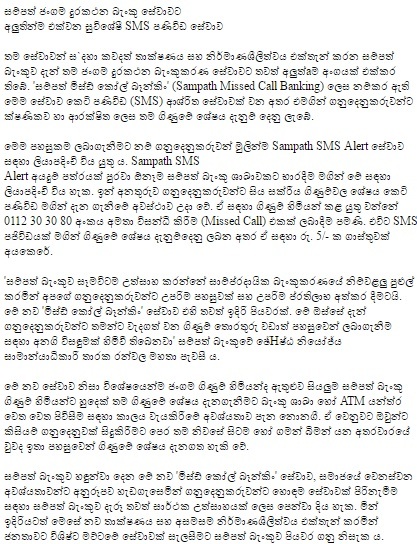 To activate facility of Sampath Bank Account Balance Check via SMS, first you should want to register in Sampath SMS Alert service. In previaously Sampath SMS Alert not provide Account Balance Check facility for their customers and need Sampath bank Vishwa online account for this. But now, Sampath bank vishwa account not needed for check your Sampath Bank Account Balance. Dial 011 2 30 30 80 it will automatically become a Missed call. You will instantly recieve an SMS to your mobile phone with your avialable bank account balance.